The new logotype enhances our commitment to our brand promise. One thread. Unlimited colors. This work will strengthen the company and steer us into the revolution we are aiming to start in the textile industry. We have optimized our new logotype for communication in all channels which is one of our goals with this work. Both the text and symbol in the new logotype is based on the chameleon. The circular shape of the eye has influenced the choice of the font and how its customized for our use. The symbol of a chameleon showcases the many possibilities with our technology, smooth gradients between the color of your choice. 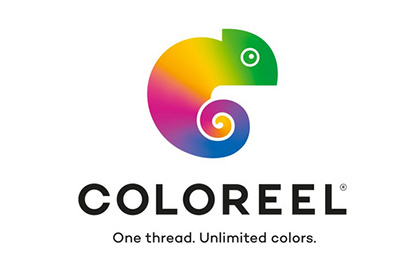 ”The chameleon has followed us in various shapes ever since the start of the company through different kind of embroideries and now as our new logotype,” says Magnus Hellström, VP Sales & Marketing at Coloreel. As a part of this work, we have also changed our parent company name from Inventech Europe to Coloreel Group AB. The company was founded in 2003 with the model to drive innovation for large companies. In 2009 the decision was made to work only with textile thread coloring solutions.